Day 17... A favorite photo of myself and why. This picture is from my wedding last January. It wasn't posed at all. Completely candid. I think the candid photos make for the best memories. I'm pretty sure that I was looking at Bill and the bridal party in this one a few minutes after we were married. I like this picture, because I look so happy and peaceful. Ready to embark on my new life. I also miss wearing the wedding dress. I had gotten my make up and hair professionally done that morning. I loved that. I want to always remember that moment where I stood back and soaked in all the happiness of that day. What a gorgeous photo! 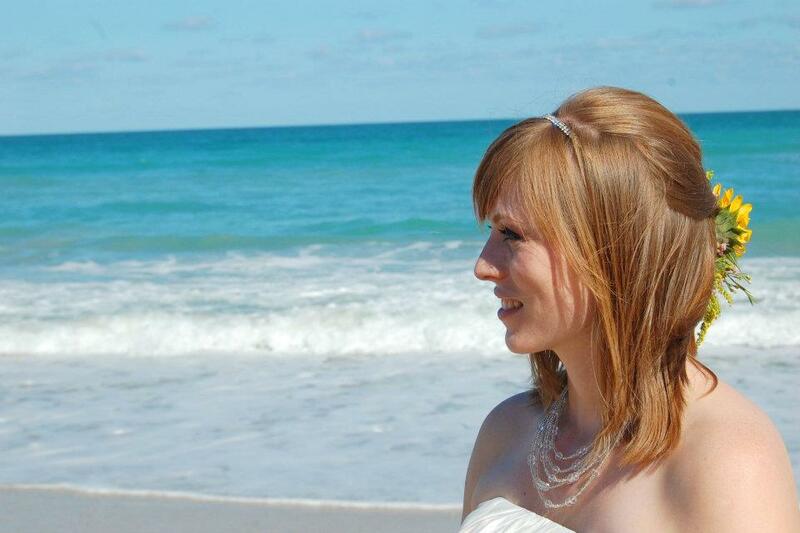 Beach weddings look so dreamy! If only I had the ability to pull of the look of standing in the wind like you do! you should just wear that wedding dress whenever you want. I give you total permission. except in Wal Mart. Things that school didn't teach me.